Ever wonder where our American Christmas traditions originated? 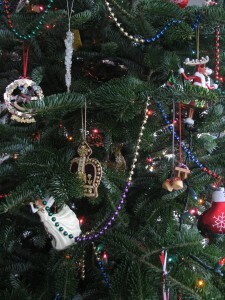 There are so many, and a few years ago I began to question our strange holiday rituals. 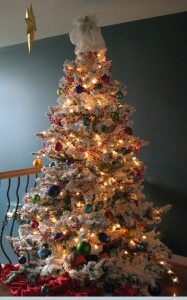 One of the most magical traditions for me is the Christmas tree. Seeing a wide-eyed child gazing at a richly decorated tree got me pondering its origin. 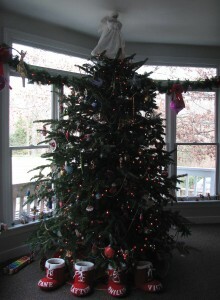 Specifically, why do we bring a dying tree into the house (or buy an artificial one,) string lights and hang ornaments on it? Naturally but curiously, our traditions are borne in history and may take us all the way back to ancient Rome for the first decorated tree. Fast forward to Western Germany in the 16th century— “Paradeisbaum” or paradise trees were brought into homes on Christmas Eve to celebrate the annual Feast of Adam and Eve. The first American Christmas tree is uncertain, but it is thought they were introduced around 1700 by German immigrants. Although there is no official documentation, the first decorated tree on North American soil may have been during the Revolutionary War, and is believed to have been created by homesick Hessian soldiers (Trenton, New Jersey- 1776). In fact, some theorize that the merriment on Christmas Eve by their confident opponents may have given General Washington and his troupes an edge and actually turned the tide in the fight for independence. 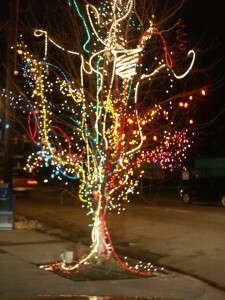 Another story places decorated trees with the (German) Moravians of Bethlehem, Pennsylvania in the early 1800’s. Simple baked ornaments adorned the trees and were eaten at the end of the season. In the years following the civil war, traditions of the season spread widely across North America. Children’s books told tall Christmas tales and played an important role in creating and spreading Christmas traditions, tree trimming, and gift giving. Women’s periodicals of the day offered suggestions for holiday decorations and how to make them. By the late nineteenth century, the Christmas spirit had captured our American imaginations. From these humble beginnings came the essential components of our modern celebrations. Our customs have since evolved into something of a unique blend of practices from many countries and is also the product of contemporary life in the fast lane. Now we eagerly decorate to all levels of fancy, cook, party, and enjoy the season in every way imaginable. We also shop till we drop. Why not consider bringing back some of our deeply rooted traditions, recognize advertising and commercialism for what it is, remember what’s important, and make time to create lifelong memories with family and friends! WOW, I had no idea. Thanks for sharing! I was wondering why we put dead trees up in our house. Although beautiful, it doesn’t seem very eco-friendly. I feel bad for all those trees that get thrown out the first week in January. Maybe next year we’ll decorate a live tree in the backyard instead! Ahh, but then I’d miss all the warm fuzzies I get from sitting on the couch and looking at those twinkling lights… decisions, decisions! Those trees sure do bring a lot of happiness though. I kind of gave up on the spirit of Christmas until we had our son. Now it has a whole new meaning and purpose! I had a big problem years back with all the dead trees, and seeing them lying beside the road was after Christmas seemed so sad. But I realized they are now grown as a renewable crop. For every Christmas tree cut, probably two are planted. Fake some how just doesn’t do it for me. Chipping and mulching the tree is probably the ultimate answer for disposal. Perhaps your county does that.